With a ton of experience in the gardening world, Great Little Garden is an online garden retailer that us here at WhatShed have been meaning to take a closer look at for a while now. So we have rolled up our sleeves and given their site and products a real good looking over. Keep on reading to see just what we think of One Little Garden. One Little Garden is a garden retailer that as well as being a business actually care about people getting out and enjoying their garden. The team behind Great Little Garden has a ton of experience and one of the cool things about this is that one of the people, Phil McCann is an actual TV producer on the show, Gardener’s World which was on the BBC. Having a person like this one the team certainly does peak our interest right away. When we started our Great Little Garden review the first thing we had to check out was the garden buildings that they offered. So we clicked on the tab and we must say that we were impressed with what we saw. We checked out their sheds category and from here you can see that Great Little Garden really are all about that traditional garden look as they specialise in wooden sheds. There is a nice selection here ranging from smaller models like their 4×3 Apex Overlap Pressure Treated Security Shed to something larger like the 12×8 Double Door Overlap Apex Shed. Wooden sheds are their specialty so do not expect to come and find a range of plastic or metal sheds. But to be fair to them, we actually like how they are a lot more selective about the products that they stock. You are not going to find much in the way of cheap and cheerful when it comes to sheds at Great Little Garden. 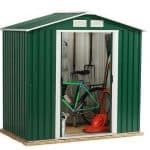 But as the people behind the site know what they are doing, we think this is a good thing as they are clearly only stocking sheds that meet their own personal standards and if it is good enough for a pro gardener then it is going to be good enough for the average Joe. Of course, any garden retailer worth their wellies have to stock more than just sheds and thankfully Great Little Garden does. To start with their garden buildings section has what you would expect such as summerhouses, greenhouses and other things like high log cabins. But this is just the tip of the iceberg for the products that these guys offer as they have a section dedicated to outdoor living and here is where you will find things like garden furniture, gazebos, lighting and even barbeques. They also have pretty much every “extra” that you might need for your garden ranging from fencing to seeds, tools and even things to support wildlife like bird houses/baths and nest boxes. There is a large selection of items for your garden here and we can honestly say that we had a lot of fun looking around and saw a few things that we did not expect, but made us think “that would look great in our garden” this is because the team behind Great Little Garden clearly know what they are doing and what products to stock. While clearly quality is something Great Little Garden care about they still have some fantastic budget priced products for sale. Their cheapest sheds (as of writing) for example are the 4×3 Overlap Dip Treated Shed No Windows and the 5×3 Overlap Dip Treated Shed No Windows both of which are under £160 and both of which are what we would class as good quality budget priced sheds. We really like how they have a good selection, but when you look through them, you can clearly see that they have an eye on price as the majority of their sheds are coming in at under £500. 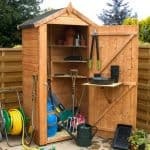 So in regards to sheds, we think that Great Little Garden is right on the money when it comes to their prices. They clearly know that you do not need a 2 grand shed to take care of your garden. As well as the sheds, we made sure to have a good look around the site at other products. When it comes to relaxing in style in the garden their summerhouses are also priced very well. They have decided to stock more modestly priced (but still nice quality) summerhouses and we think that is great. They do of course have higher end items and this is really evident in their log cabins section. Here they have some very nice and high quality log cabins which may raise your eyebrows at first when you see the 1 or 2 grand price tag, but for log cabins of this size and quality, the asking prices are right in line with what other garden building retailers are asking. But with these guys, you have the added bonus that they clearly know what they are looking for so they only stock items that they feel are good value for money. One other thing we want to mention in regards to pricing is their extras. 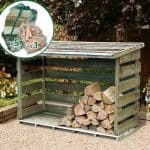 When it comes to sheds shelving options, brackets, tools or a million other things they have lots of little items that are very inexpensive, but can do wonders when it comes to stocking your shed or even serving as a little gift for someone who is a keen gardener. In all, we must say that we feel the prices at Great Little Garden are very reasonable and there was nothing that made us spit out our morning coffee which is always a nice thing. One of the more interesting parts of this Great Little Garden review has to be how easy their site is to use. It is a pretty straightforward site and one that is easy to navigate. On the homepage, along the top of the screen, you have a series of tabs. Plants, Outdoor Living, Garden Buildings and so on. You can click on these or you can hover over it to be a bit more specific. For example, if you hover over garden buildings, you can then pick from more specialised menus like sheds, summerhouses and so on. It is simple to use and if you have used a site before then you will have no trouble navigating around here. Also on the homepage, they have a sale section which we always like to see, but they do a great job in promoting the special offers they have going on and this is the first thing that catches your eye. When we were looking at the site, for example, they had a Great Garden Sale which was offering 25 percent off a ton of products. They let you know this right away on the homepage which is a nice touch. If we had to be critical, we would say that when you click on sheds the first thing you see is shed accessories. This is great, do not get us wrong, but we feel that when you click sheds, sheds should be the first thing you see not accessories. A minor thing we know, but we felt it was worth mentioning. But what about when you find something you like? Well as always we clicked on a lot of products from all different categories to see what kind of information and how easy to navigate it was. Let’s take their 6×4 Shiplap Dip Treated Apex Shed for example. When you click on the product, you are given easy to read bullet points about the highlight of the shed. 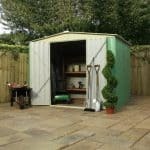 But when you scroll down further you can get more information and a detailed description as well as all the information about what the shed is made from, the exact dimensions and even what accessories are available. We checked out many different products and they were all as detailed as this. We think this is awesome as giving people this amount of information ensures that they will be as informed (if they actually take the time to read it of course) as possible about a product before they buy it. The knowledge of the guys at Great Little Garden really shines through here. One thing we always like to check for is how easy it is to ask a question. Well, they have their phone number all over the site, but you can also email them. One thing we love is they do have a live chat and unlike many other garden building retailers that we have come across. They actually give you the times that their live chat is active. In all, we had no trouble looking around the site at all and while you may have to do a little clicking around to find exactly what you want, it is easy enough to do that we do not think it is an issue at all. The first thing we want to mention here is that every single product we clicked on allows for customers to leave reviews. You do this by going to the description and clicking the reviews tab. Here you can leave a small review. Now the review does not automatically get published and instead it gets put forward for moderation so the people at Great Little Garden will always check a review before it is posted. We do not have a problem with this at all as it can help stop fake reviews being posted. But at the same time, we could not find a single review on the site! Also when you click a section, let’s take greenhouses for example. When you are scrolling down the list of products each one has a series of stars, which we assume are the rating from reviews. But when you leave a review it does not ask to give it a star rating. To be fair as the reviews are moderated, perhaps the people at Great Little Garden get back in touch with the person who left the review to ask them to give a star rating, but when you leave a review it does not ask for an email address so we are not sure how you would do that. We know that the people at Great Little Garden clearly care about the products they sell and honestly, we did not find anything at all on the site that looked cheap and rubbish. So they clearly care about the customer. We just think that they need to come up with a way to get some reviews on the site as we could not find any. Maybe they could push the people who buy their products a little more to leave a review. Offering a small money off coupon or a packet of seeds could be a good incentive for people to leave reviews on products they have bought. What Are The People Saying About Great Little Garden? When we review a garden retailer, we love to look around at some of the more popular online review sites to see what real customers have had to say. That is why we have this section here where we have looked at the review scores that actual customers have given Great Little Garden. As always when you read an online review about a company always remember that people are far more willing to take the time to write a review about a negative experience than a good one. So do not always just go straight to the 1 or 5 star reviews. 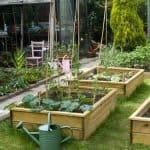 The first place we have checked is our buddies at Trust Pilot who do actually have a Great Little Garden review section. As of us writing this review, there are 36 reviews for Great Little Garden on Trust Pilot and they currently have a rating of 8.8 which ranks them at Great! 92 percent of the reviews are rated at 5 or 4 stars with most people being very happy with the customer service, the quality and the delivery times. Clearly, when people have a good experience with Great Little Garden it really is awesome. The most recent review we saw was from a lady called Diane Smith who had this to say, “Delighted with prompt and efficient service. I would recommend to anyone.” This seems to be the feelings of the majority of people who have dealt with Great Little Garden. 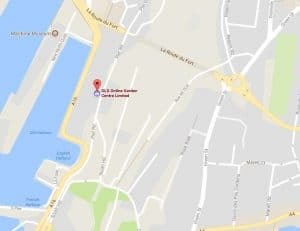 There is only a couple of negative reviews on here for Great Little Garden and while we are not excusing the bad experience these customers had. One in particular for example had an issue with their delivery date. What is interesting is that the people at Great Little Garden did respond and offer an explanation for what happened. Social media is a great way to see what people think of a company and Great Little Garden do have a Facebook Page which is great to see. We did some first rate, Facebook stalking and were happy with what we saw. Of course, they promote their products on here, but there are many comments from customers and Great Little Garden do a good job in communicating back with customers which we always like to see. There was not much if any ranting about things going wrong which was also very nice to see. Great Little Garden has a Twitter account also which is more used to promote their products that talk to customers, but it is still worth having a look at. One of the most interesting things we saw in relation to Great Little Garden is that they do actually have a Great Little Garden YouTube Channel now as one of the people behind the site, Phil McCann has experience with this kind of thing. That should not be too surprising. But we cannot think of another garden building retailer that showcases their products in a way like this. What does this have to do with online reviews? Well if you click one of the videos, people can actually leave comments. Now as far as we can tell the YouTube channel has not taken off yet, but as more and more people use their site and buy products that are showcased in videos, we feel this could be a very good place to not just get more information on a product you are interested in, but also to see what other people are saying about Great Little Garden. The style and personality of Green Little Garden is something that we really like and when we think about it there are no major concerns that pop into our minds. Like we said before, maybe making sure there are some customer reviews on the site would be something they could work on and perhaps not having the shed accessories be one of the first things that show up when you click sheds is another. But to be fair these guys are doing what they do very, very well. Just going back to what we talked about, but the customer reviews are the only thing that we would like to see improved. We think the selection of products, the way they are showcased and just the site in general really are fantastic. We would just like to see more opinions from people who have bought these products on the site. This is a site that we can see really blowing up as more and more people find out about it and we hope that they have the right amount of staff to deal with this. Once people find out how good they are, we are sure more and more people will be heading here for their next garden building purchase. We spent a lot of time with this Great Little Garden review and it is one that we really enjoyed working on. These guys know exactly what they are doing and you can clearly tell that they are run by a gardener for gardeners and we think that is very cool. These guys as the years go on are only going to get better which is saying something as we have very little to complain about right now. So if any of you guys at Great Little Garden are reading this, keep on doing what you are doing. As you can tell by our Great Little Garden review this is a site that we are very impressed with and we cannot wait to see how it grows in the future. But while we had a great experience with the site, we would love to know what you guys think. Have you used the site? Well if you have let us know in the comments section how your experience was as we would love to know. I am disappointed with delivery and customer service. Be aware that the site advertises free delivery* and 5 day delivery**. It seems anywhere north or Leeds incurs a £19.99 delivery charge and the delivery time is not predictable. I ordered a new shed, paid for delivery and received an expected delivery date 5 days later. After a no show and then chasing GreatLittleGarden several times via phone call and email, I have received my delivery fee back but still have no information at all about when my shed will be delivered. It has been 3 weeks since my order was placed and no one has communicated when my order will arrive. This is a bad customer experience. I believe the shed will be fine when it arrives however I expected it 2 weeks ago. The website should make this clearer to users and not provide false estimated delivery dates. Free delivery and 5 day delivery were 2 main reasons for choosing this company.